About Road Trip Rentals, Inc.
We offer camper rentals (the Rockwood Roo, model 183) in Virginia and surrounding areas. This allows you the opportunity to hitch up the camper and tow it to your destination of choice. Check out our rental fleet and book your rental today. Discover your Road Trip! Contact Road Trip Rentals, Inc.
45 Reviews for Road Trip Rentals, Inc. Rent a Rockwood Roo, Model 183 hybrid style camper and tow it to the destination of your choice within the U.S. and Canada. Our trailers are lightweight, easy to use, and cost effective. They are easy to pack and set up once at your destination. Don't have a towing vehicle? We can deliver the camper to the destination of your choice. Ask us about options. There are so many wonderful needs for renting a camper. Celebrate the Virginia State Park System, enjoy music festivals at places like Watermelon Park in Berryville, VA and Glen Maury Park in Buena Vista, VA, take part in a barbecue contest, compete in a sporting event, or just float down the river. You can see and do it all in a Road Trip Rental. Discover your Road Trip! A. "Agreement" means all terms and conditions found in this form, any addenda and any additional materials we provide at the time of rental. B. "You" or "your" means the person identified as the renter on this form, any person signing this Agreement, any Authorized Driver and any person or organization to whom charges are billed by us at its or the renter's direction. All persons referred to as "you" or "your" are jointly and severally bound by this Agreement. C. "We", "our" or "us" means the business renting the towed Vehicle to you. D. "Authorized Driver" means you and any additional drivers approved and listed by us on this Agreement. E. "Vehicle" means the non-motorized towed recreational vehicle identified in this Agreement and any vehicle we substitute for it. F. "Loss of use" means the loss of our right to use the Vehicle for any reason because of damage to it or loss of it during this rental. Loss of use is calculated by multiplying the number of days from the date of damage to the Vehicle until it is repaired or replaced times the daily rental rate. A. This is a contract for rental of the Vehicle. B. We may repossess the Vehicle at your expense without notice to you if the Vehicle is abandoned or used in violation of law or this Agreement. C. You agree to indemnify us, defend us and hold us harmless from all claims, liability, costs and attorney fees we incur resulting from, or arising out of, this rental and your use of the Vehicle. D. We make no warranties, express, implied or apparent, regarding the Vehicle, no warranty of merchantability and no warranty that the Vehicle is fit for a particular purpose. A. You must return the Vehicle to our rental office or other location we specify, on the date and time specified in this Agreement, and in the same condition that you received it, except for ordinary wear. B. If the Vehicle is returned after closing hours, you remain responsible for the safety of and any damage to the Vehicle until we inspect it upon our next opening for business. C. Service to the Vehicle or replacement of parts or accessories during the rental must have our prior approval for any charge. You must check and maintain all fluid levels. D. In cases where you are given approval to do repairs during your rental, please save and submit all receipts for repairs. Refunds will not be made without a receipt. A. You are responsible for all damage to, or loss of, or theft of, the Vehicle, which includes the cost of repair or the actual retail cash value of the Vehicle, if it is not repairable or if we elect not to repair it, loss of use, diminished value of the Vehicle caused by damage to it or repair of it, missing equipment, and a reasonable charge to cover our administrative expenses connected with any damage claim, whether or not you are at fault. B. You must report all accidents involving the Vehicle to us and the police within 24 hours of occurrence. A full written police accident report must be submitted to our management upon your return. Failure to comply will result in the forfeiture of your security deposit. H. and, if the Vehicle is equipped with an outside fuel station, using any fuel octane-rated higher than 87. A. You must provide proof of liability insurance coverage on the towed Vehicle through the personal auto policy covering the towing vehicle. We provide a form to be filled out and signed by your insurance agent/company that constitutes the needed proof. Contact our office for a copy of the form or download it from the Rent A Camper page of our website at www.roadtriprentals.biz. B. We provide collision and comprehensive insurance on the Vehicle with a $250.00 deductible per occurrence. You are responsible for this deductible if claims are made for damage from your rental. C. We also provide an additional $1,000,000 worth of liability coverage for incidents where your liability coverage limits are reached. A. Nightly rate  $110, Weekly Rate  $595. Rate is the same for both styles of trailers, the Rockwood Roo, Model 183 and the Rockwood Mini-Lite, Model 2306. B. 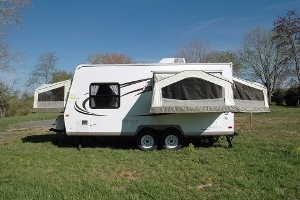 There is a three night minimum on all camper trailer rentals, unless otherwise noted. Drop-offs and pick-ups are not permitted on Saturday or Sunday. So, any rental that includes a Saturday night must also include the following Sunday night. C. Our hours of operation are Monday through Friday 8:00 AM to 6:00 PM, and all visits are by appointment only. D. Your only restriction for pick-up and drop-off time is that they must be within the standard hours of operation on the scheduled days, unless otherwise noted in writing ahead of schedule. A. If the Vehicle is returned late, meaning any day following the scheduled return date, then you will be charged two times the nightly rental rate (2 X $110 or $220) for each day the Vehicle is late. B. If you are uncertain about your return date and time, then contact us to discuss options. C. It is more cost effective to reserve the Vehicle for a longer timeframe and be due a partial refund then it is to return the Vehicle late. D. REMEMBER  Other people may be waiting for the Vehicle that you are renting, and we dont want to ruin their vacation. Please contact our office if you are going to be delayed. i. The deposit required for reserving a camper rental is payment in full. ii. THE RESERVATION DEPOSIT IS NOT REFUNDABLE within 30 days of the start date for the rental period. iii. In situations where you must cancel your reservation within the 30 day window, then the reservation deposit is credited to a future rental, as long as it is booked within a years time from the original reservation start date. iv. For reservations cancelled more than 30 days in advance, a full refund is honored minus a $35 processing fee. i. A $500.00 security deposit is required prior to the start of the rental period. ii. If your rental is less than 30 nights, the Security Deposit is run as an Authorization Only, not an actual charge, if you are using a credit card. This reduces your credit line by $500 and authorizes us to charge up to $500 for 30 days, but again, is not an actual charge. If you are using a bank card or check cashing card instead of a credit card, then the Authorization Only process does actually hold $500 of your cash balance in the bank account the card is attached to. Please consider this when providing a card for the Security Deposit. iii. If your rental is greater than 30 nights, then we do actually charge you the $500 for the Security Deposit, regardless of what payment method is used. iv. The Security Deposit is refundable within 5 business days of your return date providing you follow all the terms and conditions detailed in this document, and the camper trailer is not damaged or abused in any way. 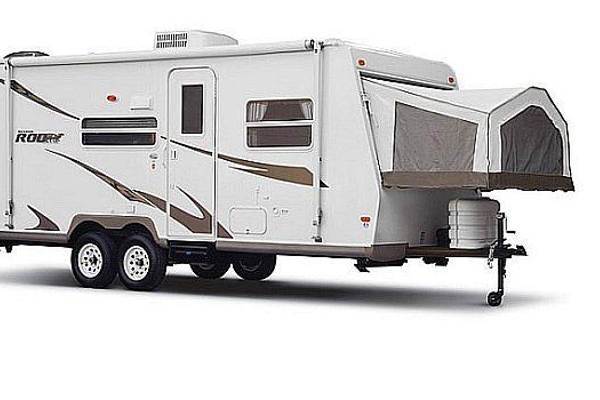 v. If the rules detailed in this document are not followed or the camper is damaged and/or abused in any way, then charges will be made against your Security Deposit. vi. Please review the additional charges listed below to better understand what is required from you in order to receive the full security deposit refund. vii. 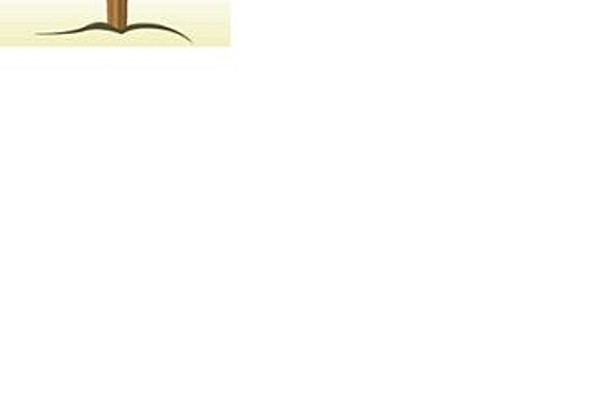 It is definitely to your financial benefit to understand and follow all the conditions about security deposit refunds. viii. We expect and understand use of the Vehicle but not abuse of it; please take care of the Vehicle. A. You will be charged a $150.00 fee if the camper is not returned as clean inside and outside as when it was received. If it is nice and clean, then there is no charge. B. Clean is defined as the following: the bathroom needs to be cleaned well such that there is no evidence of use other than normal wear and tear including the sink, shower stall, and toilet; the kitchen area needs to be cleaned well such that there is no evidence of use other than normal wear and tear including the stove, sink, microwave, and refrigerator; the cabinets need to be emptied and wiped down; the beds need to be vacuumed or brushed; the floor needs to be vacuumed or swept and then mopped, and finally the outside needs to be washed from any road splatter incurred during the rental period. C. You are welcome to just pay the cleaning fee up front to eliminate yourself from the responsibility. D. Moreover, you can use our facility to clean the camper upon your return, if scheduled in advance. A. NO SMOKING IS ALLOWED IN THE VEHICLE, ABSOLUTELY NO EXCEPTIONS. B. If upon the end of the rental period there is any evidence to the fact that you did smoke or allowed anyone else to smoke in the Vehicle, then a $250 fine will be charged against your Security Deposit. Please do not smoke in the Vehicle. A. Propane tanks are generally full, or close to it, when you pick-up the Vehicle. B. You are authorized to use propane as needed during your rental and do not have to refill tanks upon return. C. However, if you need additional propane during your rental period, then it is your responsibility to purchase the additional propane at your own expense. D. When you purchase propane, the existing propane tanks need to be re-filled, not exchanged for other tanks. A. We do not have the facility required for emptying and flushing gray and black waste holding tanks, so you must perform this responsibility prior to returning the Vehicle. B. Also, you are completely responsible for the expense and action of emptying and flushing the gray and black waste holding tanks during the rental period as needed. C. A dumping fee of $100.00 will be charged against your Security Deposit if the gray and black waste holding tanks are not completely empty and flushed upon your return. D. Also, absolutely nothing but human waste, toilet paper, and commercial tank deodorants or chemicals are allowed in the toilet. No paper towels, baby wipes, feminine hygiene products are allowed. Any evidence of this rule being broken will result in an additional $100 charge against your Security Deposit, over and above the $100 to empty the tanks, regardless of whether any damage occurs. A. Our season runs from April 1st through November 1st. On the rare occasions a rental is reserved outside of those dates, a $100.00 fee is required, unless otherwise noted. B. This fee is not refundable. v. $100, plus $5/mile for every mile between the renting location and the place where the Vehicle is returned, repossessed or abandoned, if different than the renting location detailed in this Agreement, plus any additional recovery expenses we incur, unless otherwise specified and authorized in writing ahead of schedule. B. We will refund charges for any rental, in which the Vehicle is returned earlier than the date or time due in, except for when a vehicle is returned in less than three nights of rental. C. We may use your Deposits to pay any monies owed to us under this Agreement. A. All fees and deposits are payable by certified bank check, personal check or major credit card (MasterCard, Visa, or Discover, not American Express). B. We do not accept cash. C. We require a credit card be on file for you, regardless of how you pay for the rental. D. Full payment is due at least 24 hours before departure i.e., rental rates, taxes, delivery fees, security deposit, winterizing fee, etc. If payment is made by any means other than credit card, then arrangements must be made in advance to ensure payment is cleared 24 hours prior to your departure. A. We reserve the right to refuse any applicant. B. Terms and rates are subject to change without notice. Any additional and/or different terms and/or rate changes will be disclosed at the time the rental contract agreement is signed upon the day of your departure. C. A waiver by us of any breach of this Agreement is not a waiver of any additional breach or waiver of the performance of your obligations under this Agreement. Our acceptance of payment from you or our failure, refusal or neglect to exercise any of our rights under this Agreement does not constitute a waiver of any other provision of this Agreement. Unless prohibited by law, you release us from any liability for consequential, special or punitive damages in connection with this rental or the reservation of a vehicle. You will indemnify, defend, and hold us harmless from and against any claim arising out of unsafe fueling practices committed by you or your agent. If any provision of this Agreement is deemed void or unenforceable, the remaining provisions are valid and enforceable. This Agreement Shall be interpreted under Virginia law. Any action to enforce this Agreement must be brought in the Courts of Prince William County, Virginia. D. Personal Information: Proper identification, employment information, credit references, insurance information, and valid drivers license information must be presented when reserving a vehicle. We will make a copy of your drivers license before you depart on your rental, and all information will be verified prior to confirmation of the reservation. F. All drivers must be at least 25 years of age. G. Orientation: A thorough orientation of all operations to the camper trailer will be given before departure. It will take from one to two hours. A more convenient time in advance of the departure may be scheduled if necessary to avoid taking up some of the rental period.